Want Your Document to be Printed on Stamp Paper? Do you prefer drafting your own legal document tailored to meet your requirements? Sure, go ahead. If you are eager to take your first step, we would be happy to help you with the process further. So you take care of the document drafting part while we purchase Stamp Paper for you and get your document printed on it. We will deliver the printed document to your doorstep. Select the type of your document which you are planning to get printed on Stamp Paper. Choose whether it is a rental agreement, affidavit or other, for any other type of document. Choose the State of which Stamp Paper has to be purchased. For any property related document, choose the State in which the property is located while for affidavits, the State in which applicant resides should be selected. Enter the details of the first party and second party exactly as used in your document. In case of affidavits, there is only one applicant, (i.e., deponent, the person making the affidavit). Upload your document that has to be printed on Stamp Paper. You can upload the file in .doc format. We will not edit the document so before uploading make sure that your document is ready to be printed on Stamp Paper. Select your preferred denomination of Stamp Paper to be bought by us. For e.g., if you choose Rs 20 denomination, then we will purchase Rs 20 Stamp Paper in your name and print the uploaded document on it. Usually, for all documents, there will be a recommended value of the respective government. It is advised that you make sure that you have selected the government recommended value. If you are looking to buy only stamp paper, either single or in bulk, then click here and place your order. Provide a delivery address, to which the document should be delivered. If the address provided by you is not clear enough, it may lead to delay in delivery. We will purchase Stamp paper in your name and print the document provided by you on it and deliver to your address. If you want to get the document quickly, then kindly select “Same/Next Day Delivery” option. Otherwise, your document would be delivered within 3-4 business days. Please note that the shipping charges do vary based on the delivery option you choose. 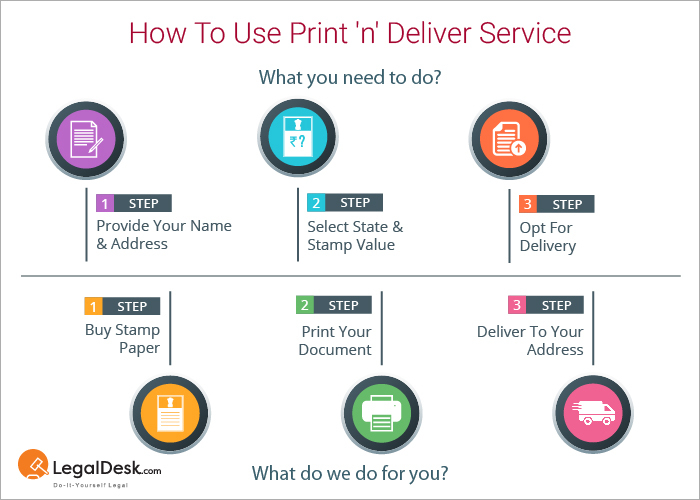 Hope you have understood what exactly you can do by availing our Print ‘n’ Deliver service. And now, if you are looking to get any of your document printed on Stamp Paper and get it home-delivered, then get started. We will be happy to assist you at any point throughout the process. So without spending any more time thinking, just place an order by clicking the button below. 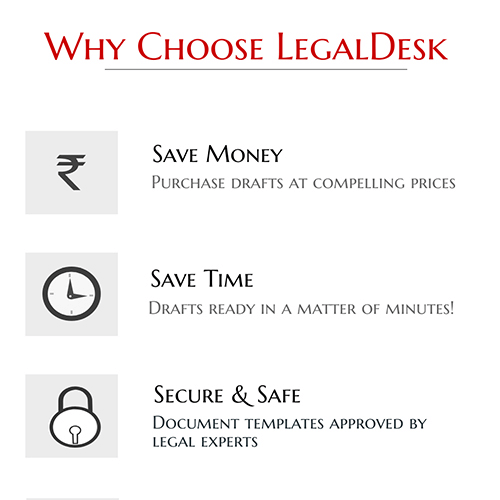 For any queries or concerns, please email to support@legaldesk.com. We are also active on Facebook, Twitter and other social media platforms. You can leave a message and we will get back to you at the earliest.